Today on the YarnThing Podcast with Marly Bird: Crochet Expert Karen Whooley (and knitter too)! Karen learned to crochet when she was 7 years old. Her old Italian grandmother was their babysitter and felt that they were watching too much TV, so she got out yarn and crochet hooks and taught them to crochet. A couple of years later, her grandmother gave her a small steel hook and thread and she started doing Italian crochet lace. Since her grandmother couldn’t read English patterns, they worked from pictures, just figuring out what to do. As she grew older, Karen began teaching herself new techniques from books like Tunisian crochet. On the design side, a friend encouraged her to start submitting designs which she did in 1998 and has been going since. Various family members had tried to teach her to knit, but since she had been crocheting too long, holding the yarn in her right hand didn’t work. Finally in 2004, she found continental knitting and now she knits too! Because she is obsessed with socks and shawls, Karen has many patterns for both, including books. She has two books of just crochet socks as well as several patterns with magazines. Now, a lot of people have the misconception that crochet socks are always really bulky and uncomfortable, but Karen shows you how to use finer gauge yarn and good stitches to use for the sole to make them more comfortable. Crochet socks sill aren’t for everyone (some people have really sensitive feet), but if you have wanted to try them, check out Karen’s book, you might be surprised! Karen’s latest work involves Fair-Isle crochet. She had a stranded sweater that she absolutely loved when she was younger and one of the first things she learned when she learned to knit was how to do stranded knitting. Later, she took a class on doing a specific color illusion picture technique with crochet. Through experimentation, she took this technique and figured out how to do Fair-Isle crochet patterns that don’t lean and look good. Karen teaches this both with floats (like in stranded knitting) and tapestry style, where the carried yarns are enclosed in the stitches. In addition to her Leisure Arts book, Karen’s Craftsy class just recently went live! The class teaches you all about the techniques and process of doing Fair-Isle crochet! Listen in below to hear everything Marly and Karen talked about today including how she stated crocheting and knitting, Fair-Isle crochet, how to still craft with arthritis and much more! And we can’t forget the Giveaway! Leave a comment below for your chance to win you own access to Karen’s Craftsy class! I love fair isle knitting but have never tried it in crochet. I would love to give it a try and it sounds as though Karen’s Craftsy class would be the perfect place to start. I hope I win! I didn’t realize until this podcast that you can do Fair Isle in crochet. Actually, I should have known better . . . thanks to great designers like Marly and Karen, all these wonderful techniques are not exclusive to one craft. I love the looks of fair isle and have done a touch in knitting. I never thought about it in crocheting but it would be great to experiment with it. Thanks for the discussion. It is funny that we don’t realise how many techniques, like fair isle, can be used in both knitting and crochet. Thank you, Marly. I actually called the life show this time, so I was one of many. Was nice to hear you, Karen! I also knit and crochet since 1st grade. Actually my family taught me to knit first, I learn to crochet on my own. That’s probably why I hold the hook not so gracefully, but like a knitting needle. I even did a test crochet for you! That was fun! I know about Tapestry crochet, but not sure if know FI crochet. Would be cool to learn it! I love to learn. Anything and everything. Life is never boring! Good luck with your growing business and congrats on new classes and books! sorry, hope my FI would still read as Fair Isle! Thanks! Colour-work is one of the techniques I want to explore; I’ve already got Karen’s Fair Isle class on my wish list. Now I just have to find the time!!! I didn’t even know you could do Fair Isle with crochet. I think I need to take your class. I did my first Fair Isle crochet this past winter. I now know what I DON’T know. It would be great to learn Karen’s tips and techniques. Karen’s Fair isle class has been in my Craftsy wishlist since it came out. Great show! I love color work in crochet. I was glad to hear the summary of the technical and visual distinctions between fair isle crochet and tapestry crochet. I’ll put Karen’s class on my wish list! I have someone else’s Fair Isle crochet book, but I think the class will make it so easy to understand. Oh, go Seahawks! I thoroughly enjoyed this podcast and am so looking forward to learning fair isle crochet! I’ve been learning fair isle knitting, but really enjoy crochet a bit more. Thank you, Marly and Karen, for bringing this to us! My SIL is a terrific crocheter and she would love learning Fair Isle crochet! I haven’t yet tried Fair Isle crochet but I did see Karen’s Crafts class and it looks AMAZING! Thanks for another great show! Fair Isle is classic and classy, sometimes even whimsical. Thank you for bringing these techniques to crochet, Karen! 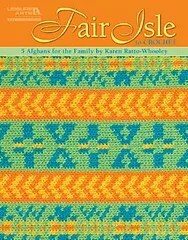 Karen has some really great Ideas about Fair Isle in crochet! Boom!! (That was my mind being blown). What a great podcast! Karen was the very first designer I ever met IRL, when she was first getting started, and I have been very curious to see what she does with Fair Isle! I was excited to hear of fair-isle crochet. I thought it was only a knitting technique. As a crocheter, I always admired the beautiful fair isle knitting. So excited to try fair isle crochet! I would love to try Fair Isle crochet . Just add another project to my long list!! Thanks, Marly……. Fair Isle Crochet looks so interesting. I have crocheted since I was 5. I love learning new techniques. Craftsy is awesome. I love the Craftsy format. so,so excited! Thank you Marly and Karen!!!! !